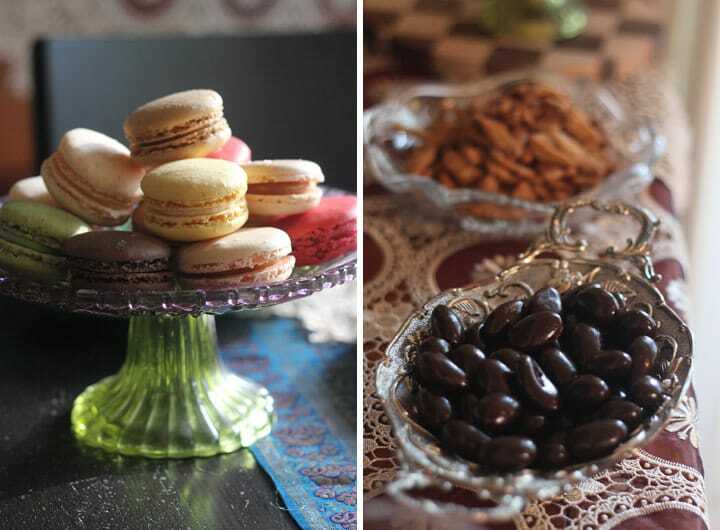 When Tori asked me to contribute some posts to her site focused on vintage-inspired entertaining, my creative mind wandered to throwing all kinds of exciting soirees. 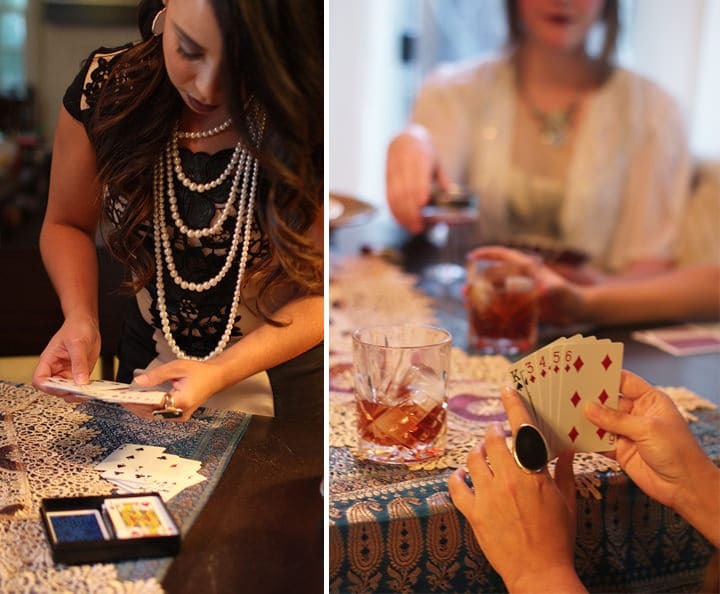 With New Year’s Eve right around the corner, what better way to celebrate than a fun themed party– like an all girls vintage poker night?! Why should the men have all the gambling fun? The only problem is, I don’t actually have much interest in learning how to play poker. 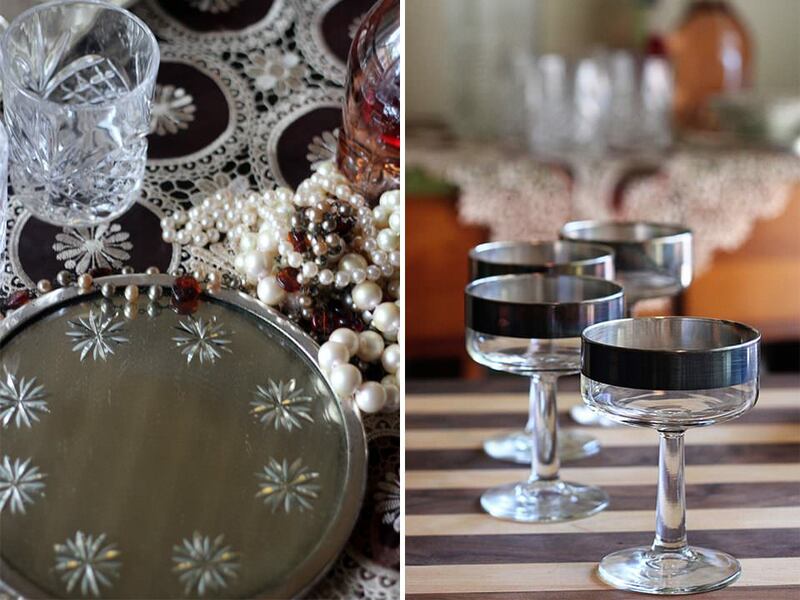 But what the heck — I’ll take any excuse to break out the fancy crystal and dress up in vintage attire! 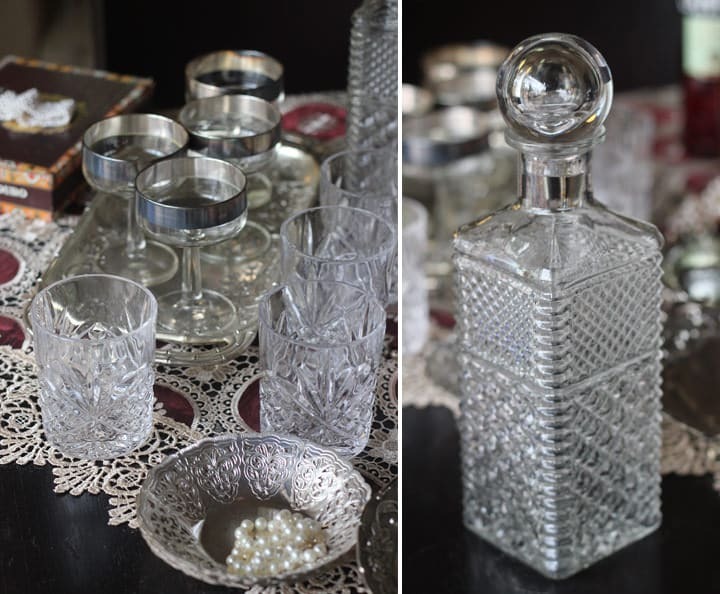 The idea to host a girls poker night started with this glass decanter. Whenever I run errands in the next town over I make a point to stop by my favorite thrift store. It’s right on the main boulevard, close to everything, and always has the best treasures. I spotted this decanter in the curiosities section right away. I know decanters have fallen out of favor since we’ve learned that lead glass can cause poisoning if liquids are kept in them for too long, but I was a sucker for it anyway. The clear round top called out to me. I imagined the decanter sitting in a pretty bar cart. I would take pictures through that round sphere, distorting everything delightfully and maybe I would even peer through it to take a selfie. I love funny old things like this. And don’t worry! I didn’t keep whiskey in it for longer than one night. Next I spotted the short, silver-rimmed champagne coupes and knew exactly what I needed to do. What would New Year’s Eve be without a bubbly toast at midnight? These glasses would be perfect for sipping and toasting my favorite sparkling Italian wine. I did a little research on the champagne coupes and found a similar style by Dorothy Thorpe. Thorpe was a mid-century American artist who began decorating existing glass pieces after her husband lost his job during the Depression. Her designs were so popular that she started her own shop, which came to be known as Dorothy Thorpe Inc. We now recognize her iconic whiskey tumblers that were popularized by the first two seasons of Mad Men. I’m not getting my hopes that these are the real thing (they only cost me $3 each) but they sure do look like them! 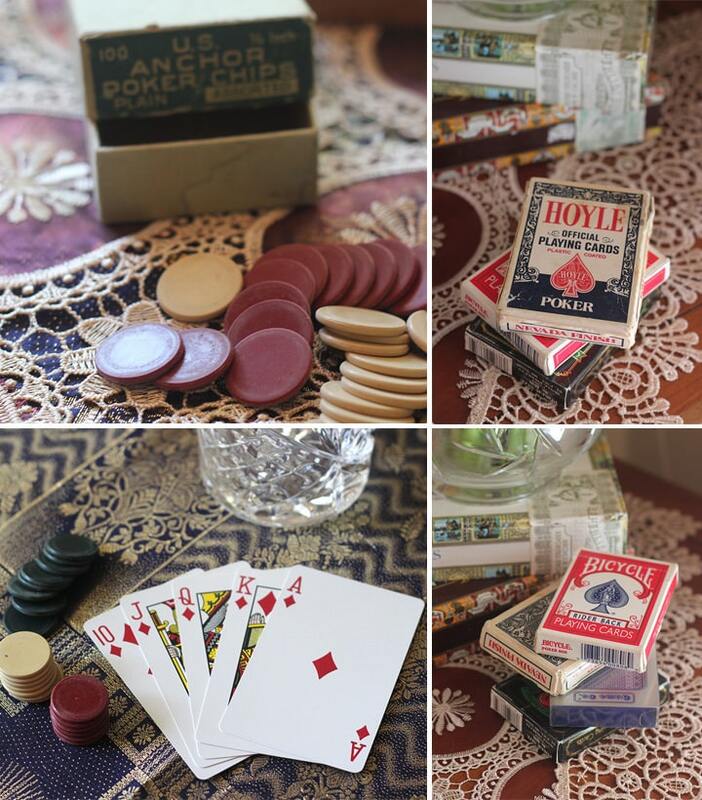 It turns out that a few of my girlfriends actually do play poker, so I found some poker chips on eBay and dug out my boyfriend’s collection of old playing cards. I wanted to spring for some vintage pin-up girl cards but decided against it, in case any of my guests found them inappropriate. Did you know there is a difference between poker chips and the chips used in a casino? Poker chips are mass-produced for home use and are made in a variety of materials, including clay and plastic. Casino chips are are manufactured by the casinos themselves and are actually used as currency when you are inside the casino. They are custom to the casino and may even include serial numbers and microchips to avoid counterfeiting. I chose these small poker chips because I liked the colors. They seemed dainty and fitting. When they arrived I was so happy with how smooth they felt in my hands. My boyfriend, who prefers the big, brightly-colored chips instead, thought I was crazy. But I had a vision. When setting the table, I opted to skip the traditional green felt cloth and round table. We aren’t that serious about playing cards by the rules. Instead I dug out my collection of saris, pinned one on the wall behind my side table and spread another across the card table. 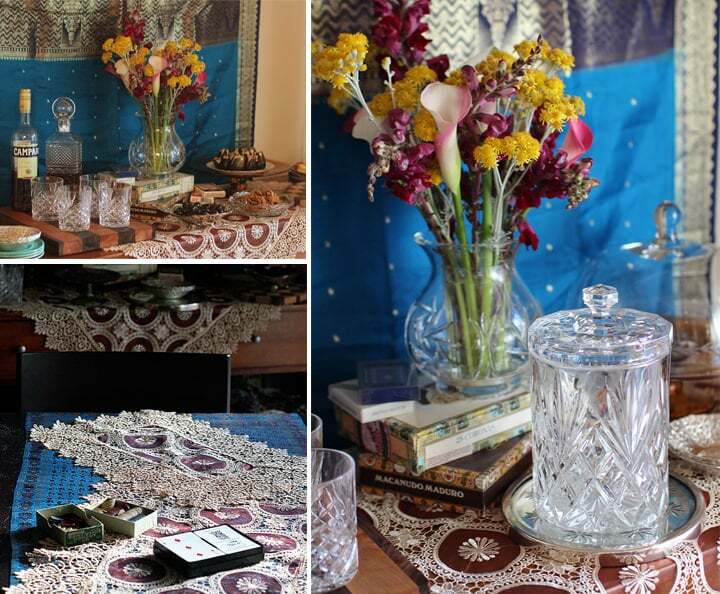 Then I placed some Middle Eastern-style doilies on top of the sari to add more texture. I brought out every cut glass item and silver tray I had in the house and set up my buffet table with fruit, cheese, crackers and chocolate. For my fruit and cheese platter I decided to use an oversized cutting board, because it can hold more. 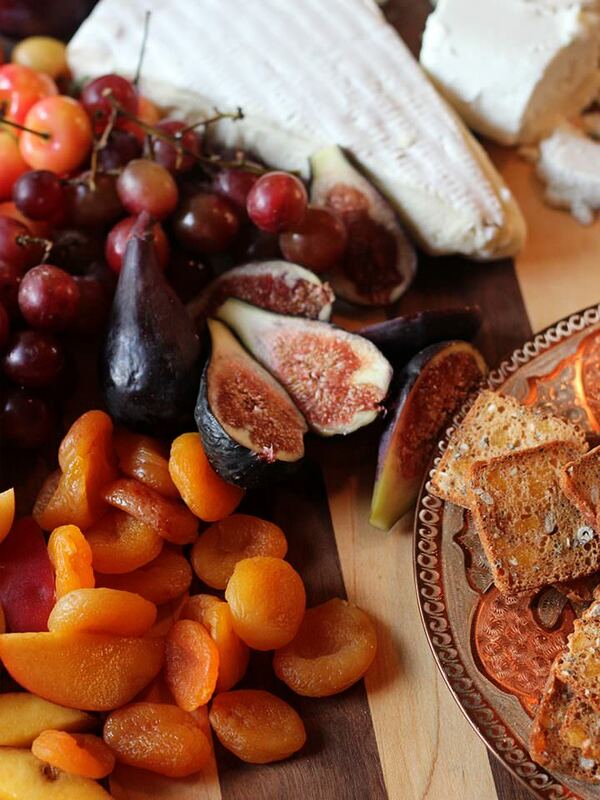 You can never go wrong with fresh and dried fruit, cheese, crackers and nuts at a party. Then I whipped up some of Tori’s famous stuffed figs with goat cheese and drizzled them with honey. I set them on a pretty plate on top of an elevated cake plate to give my dishes some height. Figs and dried fruit always make such beautiful, rich additions to any appetizing platter. For something sweet I chose macarons (my favorite treat!) and chocolate covered almonds. Since we’re not serious poker players we can set the snacks right on the table where we play cards. If you were following the rules you probably wouldn’t want to do that. I’ve heard that reaching for food can be a “tell” and reveals if a player is nervous or has a particularly good hand. Good to know! My girlfriends and I take themes seriously and always dress to the nines, which makes these events so fun! 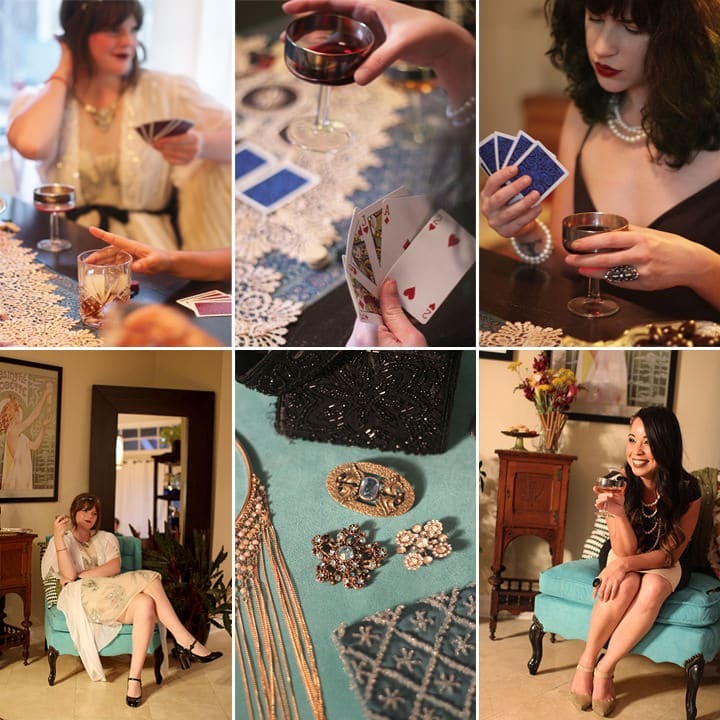 Our get-togethers turn into a something of a fashion show, as we share the stories behind our jewelry and outfits. In fact, when I send out the invitations to my friends, I like to include pictures of women in theme-appropriate get-ups for inspiration. There is nothing like a theme to get everyone excited and involved. 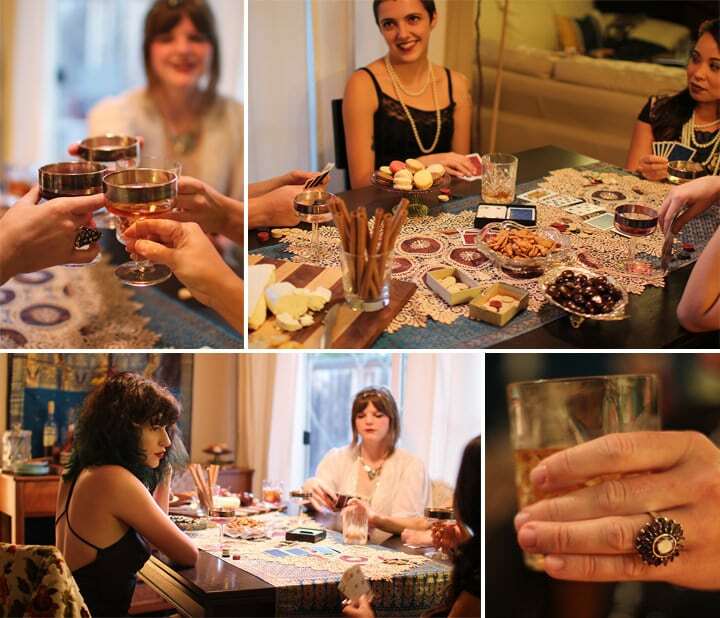 I love when everyone has a chance to wear the vintage pieces passed down from their mothers and grandmothers and this party finally gives us the perfect reason to wear them! I cannot think of a better way to ring in 2017 than with my close friends; sharing stories and enjoying each other’s company. 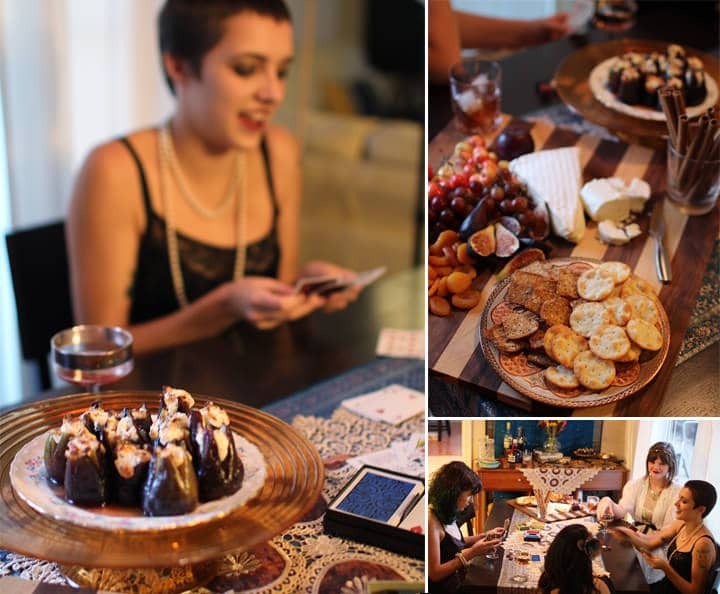 With a fun poker night like this, the odds are in our favor for a fantastic new year! It was nice reading your page. Enjoyed!